With the Grace and Blessings of the Lord, Holy Master Sri Swami Sivanandji Maharaj and Gurumaharaj Sri Swami Chidanandaji Maharaj Spiritual & Yoga activities are flourishing at Sivannda Ashram, Ahmedabad. More and more people, inspired by Spiritual head of the ashram, Pujya Sri Swami Adhyatmanandaji Maharaj are joining themselves in the Ashram’s selfless services to humanity. People from far and wide are coming to the Ashram, learning the Yoga and spreading Yoga teaching after receiving training through Yoga Teachers Training Course (YTTC) at the Ashram. Most recently, a group from China has attended three weeks residential YTTC. China Yoga Association participants for Yoga Teacher Training Course (17th YTTC) were invited by Sri Jitukaka known as Greenman, who sponsored a grand function held on Sunday March 1, 2009. The entire Yoga group was greeted by typical Hindu tradition with drum, orchestra and alike. Evening festivity included folk dance participated by all and concluded with a grand dinner. Everyone enjoyed to the fullest. On March 2, 2009 the entire group visited “Raj Bhavan”- Governor’s House at Gandhinagar. Certificates were awarded to all the participants by H. E. Governor of Gujarat. President of China Yoga Association and Taiwan Yoga & Sports Association were honored with the title of ‘Yoga Prachar Ratna’. An agreement was made that Sri Divya Jivan Sanskratik Sangh will be conducting YTTC every year at Taiwan. H. H. Sri Swami Adhyatmanandji Maharaj will visit Taiwan every year with two of his assistants to conduct the course and certificate course be given by the Sri Divya Jivan Sanskritik Sangh, Ahmedabad. On March 3, 2009 17th YTTC was concluded with a grand dinner sponsored by Sri Pravinbhai Patel, acting president of the institute at his farmhouse. The group left for Taiwan on March 4, 2009. Regular activities at the Ashram: Large numbers of new comers joined the Morning Yoga Session (5.30am - 7.00 am) conducted by Sri Snehal Amin and Sri Snehal Bhatia for the beginner batch from March 1, 2008 to March 10, 2009 and Ms. Dhara Upadhyay & Ms. Sonal Trivedi, conducted March 15, 2009 to March 25, 2009 in the evening .Yoga classes for established and advanced students were scheduled in different batches at 5.30 am, 7.00 am and 10.00 am in the morning. Evening Yoga classes for Women group and a special group were scheduled from 4:00pm, 6:00pm and 7:00 pm. Daily worship services at Lord Vishvanath Temple and at Sri Sri Maa Ashtalakshmi Bhavan create Divine Vibrations at the Ashram. Prayers & Meditation at Sri Chidananda Dhyan Mandir bring peace & joy to countless Sadhakas. Daily Evening Satsang (9.00pm –9.45pm), Sunday satsang (8.30 am -10.00 am) and ‘Paduka Pujan' on Thursday, Satyanarayan Puja on Purnima day, Gayatri Yajana on first Sunday, Lalita Shashra Nama & Yoga activities: all these have made Sivananda Ashram a pilgrimage place (Yatra Dham) in the midst of busy & noisy city life. Free clinic at the ashram on Wednesday & Friday is serving sick people in a holistic approach. Dr. Snehal Amin is a backbone of this selfless services. On March 3rd a group of devotees with YTTC group visited Gandhi Ashram Slum School and fed the children sumptuously. It is one of the regular monthly Seva projects carried out through Ashram’s devotees. Ashram also donated Rs.50, 000 as a token to the management of the school for their praise worthy services to the underprivileged children. 70th Birthday of H.H. Sri. Jasbhai Saheb, founder of Anupam Missions was celebrated on March 1st at Ahmedabad. H.H. Sri Swami Adhyatmanandaji Maharaj felicitated Him. Sri Swamiji Maharaj spontaneously composed a song in praise of Pujya Saheb and His devotion for His great Guru, most Worshipful Sri Sri Sri Yogiji Maharaj that brought a special delight to all the devotees. Chaitra Navratri (March 27, 2009 - April 3, 2009) From Friday, March 27th, the group recitation of holy Sri Ramcharit Manas has commenced and planned to continue till Sri Ramanavami. At Delhi – On March 4, 2009 Sri Swami Adhyatmanandaji Maharaj and group of devotees from Ahmedabad arrived at Delhi. Sri Swamiji visited Army hospital and private houses to bless sick and ailing devotees. A small satsang was held at Sri Ajay Yagnikji’s home also. On His return back from Punjab tour, Sri Swamiji had stop by visit again at Delhi on March 12th. A small satsang was organized at famous Dwarka locality at Sri Tarkeshwar Srivastavji’s house. Gurgaon – A wonderful satsang was organized at Srimati Nirja and Sri Vinod Kumar Singhji’s holy abode on March 4th evening. Srimati Bhavnaji’s melodious singing and Pujya Sri Swamiji Maharaj’s kirtan followed by spiritual discourse enlightened all present. Dinner was served to all after the satsang. Flower decoration at the entrance caught everybody’s attention to make a special to admiration. Panipat – On March 5, 2009 Sri Swami Adhyatmanandaji Maharaj and devottes group from Ahmedabad arrived here in the morning. They were greeted by Sri Dr. Bharat Manocha and other devotees of Sri. Rama Sharnam Ashram. Sri. Swamiji paid homage to Rev. Shakuntala Mataji, visited the ashram and went to Dr. Bharat Manocha’s house. Then the group proceeded to go to Karnal. Karnal - A very warm and floral welcome was received at Karnal at Sri Baba Amrik Singhji Maharaj’s Ashram at Nirmal Goelji’s house. Sri Swamiji visited a number of industrial houses upon devotees request and blessed visitors who came from distant towns. Karnal’s Karma Yoga Association organized evening public discourse at a grand scale in a ‘Golden Moment’ hotel. 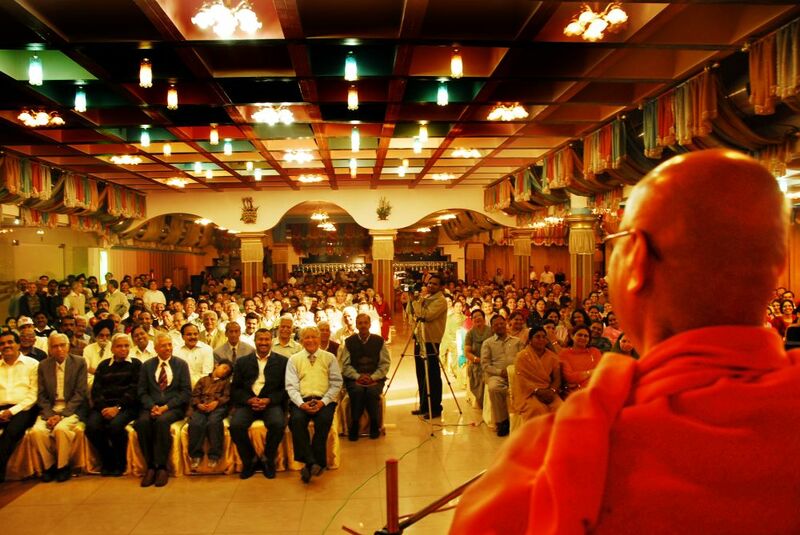 A central hall of the hotel was packed to its full capacity with devotees. “Our moral duty towards the Nation” was the topic and Swamiji apoke on the subject for full two hours H.H. Sri Swami Amrik Devji, Dr. Swami Radha Krishnanadaji and other saints graced the occasion. Satsang was followed by question & answers session. The satsang concluded with a silent meditation. Dinner was served to all after the satsang. On the March 6, 2009 Revered Sri Swamiji Maharaj graced the early morning satsang at Sri Gurudwara Sahib and shared Amritvani with Shabad Kirtan with elaborate explanation in Punjabi language. Ambala – Honoring kind and generous invitation of Dr. Omprakash Sharmaji, President of the Divine Light Society, Ambala, Sri Swami Adhyatmanandaji Maharaj visited Ambala. A half day stay here was full of home visits and satsang till late afternoon. Ludhiana – Sri Swami Maharaj arrived here at Ludhiana on March 6th evening. . Two elaborate satang were arranged and Swamiji spoke on the most important subject of spirituality “Shun the ego, that’s the only key to blessedness”. After each satsang guided meditation followed and Prasad was distributed to all present. Sri Swamiji visited an institute of management established by Jain Acharya Sri Shivamuniji Maharaj. Also visited Atamnagar, Atam Park and t, Dr. M. M. Gupta a leading ophthalmologist's nursing home and blessed his patients and medical staff. Trustees of famous Durgamata Temple invited Sri Swamiji to visit the temple and honored him. Thanks to Srimati Darshanmataji and Rev Sri Raj Kumar Jain’s family for arranging Sri Swamiji’s entire Punjab tour. Jalandhar - March 9, 2009 Monday early morning Sri Swami Adhyatmanandaji Maharaj attended 11th anniversary of yoga class conducted by Sri Devinder Aroraji at Arya Samaj Mandir, Model Town, Ludhiana. Sri Swamiji Maharaj graced and blessed Smt. Raman Kapoorji and member of her family. A press conference also was arranged by Sri Devenderji. Amritsar –Sri Swami Adhyatmanadaji Maharaj arrived here on 9th midday and He first visited the famous Sri Lakshmi Narayan temple (Durgyan) and then went to the ailing mother of the house (late w/o Sri Jiyalal Mohallaji) at Gali Jadav. A wonderful satsang- kirtan by Sri Swamiji Maharaj brought unspeakable joy and solace to grand mother ( and entire family), her wish was fulfilled of having darshan of Sri Swamiji Maharaj. She passed away March 20th. After paying homage to Sri Harmandir Sahib, Golden temple, Sri Swamiji conducted a small satsang at Srimati Monicaji and Sri Deepak Khannaji’s home. After lunch, group departed for Pachkula. Pachkula - For more than 30 years Rev. Sri Swami Adhyatmanandaji Maharaj is a regular visitor of Punjab, Hariyana, Himanchal Pradesh and J&K. Devotees here have a special love and regards for Beloved Swamji Maharaj. They eagerly await His visit, darshan and satsang with Swamiji Maharaj. Sri Swamiji arrived at Pachkula on 9th late evening. He conducted two satsang at late Dr. Akshay Guptaji’s house and also at Sri Ashwani Deogarji’s holy abode. During His stay Sri Swamiji paid his homage to most worshipful and revered Acharya Sri Shivamuniji Maharaj at Sri Atam Jain Upashraya. Also Swamiji graced and visited the newly constructed Shivananda Bhavan, the building of the Divine Light Society, Chandigarh. Chandigarh - A small satsang was organized at Dr. Nirmal Bhatia and Sri Dharamveer Bhatia’s, (IAS) residence. Sri Swamiji visited Shivananda studio of Mr. Grover, Sukhna Lake and Sri Zakir Hussain Rose Garden. Lucknow - Upon very sincere and generous invitation of Dr. Anilkumar Srivastavji, MD cardiologist (personal physician to Miss Mayawati, CM of Uttar Pradesh), Swamiji stayed here for three days to inaugurate and to grace Akhil Bharatiya Bhojpuri Sammelan. Everyday twelve doctors, engineers and artists were awarded with the title of Bhojpuri Ratan and Bhojpuri Gaurav. This honor was awarded by Sri Swamiji to these illustrious experts in their respective fields. Other than speaker of Uttar Pradesh Vidhan Sabha the famous film stars of Bhojpuri film Sri Pankaj Kesri and Sri Amit Ray also attended the Sammelan. Sri Swamiji three days stay here was full with public functions including visit to Lucknow School of Management, home visits & home Satsangs. Bhavnagar - Upon very loving and generous invitation of Dr & Mrs. Narendra Joshi’s invitation, Sri. Swami Adhyatmanandaji Maharaj visited Bhavnagar for house warming ceremony of newly constructed bungalow ‘Chidambaram’. Rev. Dr. Narendra Joshi was president of the Divine Light Society, Branch Amreli, for more than 25 years. During his short stay, Sri Swamiji visited and conducted satsang at Dr. Ashok Bakshiji (past president of the local branch of the Divine Light Society) and also addressed the students of BA and MBA at the coaching class owned by Ms. Sheetal Parikh at Pavitra. Sarangpur Sri SwamiAdhyatmanadaji Maharaj accompanied by H. H. Sri Swami Narayan Swaroopanandji Maharaj paid homage to His Holiness Sri Pramukhswamiji Maharaj. Delhi - On March 29, 2009 Sri Akshar Purushottam Mandir, Taddev, Delhi, celebrated 72nd happy birthday of its founder president Rev. Sri Guruji Maharaj in presence of holy saints, sages and leading politicians. Sri Swami Adhyatmanandaji Maharaj was the main speaker of this celebration. Nainital For 99th happy Birthday of most revered and worshipful Sri Bankeylal Consulji Maharaj, a leading Arya Samajist, Sri Swami Adhyatmanandaji Maharaj arrived at Nainital on March 30th midnight and will be staying there for 5 days. Sri Bankeylalji and Sri Swamiji have mutual, love regards & reverence for each other for the last 32 years. Sri Bankeylalji is a social reformer, freedom fighter and veteran son of Mother India.On 31st evening Sri Swamiji was invited to preside ‘Thank You India Day’ function organized by Tibetan Community of Nainital.